American Dream Mortgage Bankers, Inc. Worked alongside owner of Bank to develop and implement marketing and advertising strategies designed to increase revenue while keeping lead cost at approximately 10%. Managed 6 Loan Officers providing support on pricing, processing, underwriting and closing residential mortgage loans. Utilized technology to streamline communications between branch and main offices, creating efficiencies that increased per-loan profitability and decreased turn-around time. Directed 12 Telemarketers who consistently met leads / hour and sales / lead goals. Quadrupled business revenues through innovative marketing efforts and decisive leadership skills (1999 to 2002). Participated in the origination, processing, closing, funding and sale of more than 650 residential mortgage loans. Coordinated $126M in residential mortgage loans. Meticulously administered $11M line of credit to maximize profitability of yield spread and service release premiums. Created direct mail piece resulting in 1 closing per 2,000 and oversaw weekly targeted dispensing of 16,000 direct mail pieces. Migrated direct mail "in-house" for greater price control and shorter delivery time, resulting in lead cost below 10%. Utilize business development, sales, sales management & relationship management skills to grow loyalty and profitability while acting as the primary point of contact for Fixed Income Traders, FX Spot, Forward, Options, Emerging Markets Traders and FX Sales / Analysts at high-profile banks as well as for Corporate Treasurers at Fortune 500 Corporations and notable media accounts. Collaborate internally with Account Management, Technical and Data experts as well as Salespeople to drive solutions and increase net sales. Provide expert front-line support and training for suite of market data desktop products and FX transaction platforms while aggressively hunting for upsell opportunities. Maximize desktop revenue, enhance customer usage and transactions, and offer timely resolutions to end-users via work-flow management. Anticipate customer needs by focusing on end-user challenges and relate business intelligence to technology development organization creating client-centric solutions. Manage migration projects from legacy to current price discovery platforms across asset classes at specified accounts. Successfully spearheaded migration of 86 FX traders from legacy to modern trading platform with new graphical user interface. Build quality customer relationships with 120+ FI Traders, FX Traders, Corporate Treasurers, Media Members & Market Data. 1500+ value-added, educational face-to-face and virtual encounters with 250+ users, exceeding expected performance. Meeting and exceeding goals for 2013-2014 business-critical, time-sensitive client desktop technology migrations. Meticulously record leads, end-user and client visit details with 100% accuracy in Salesforce providing transparency to the business. Act as a mentor to persons in Business Graduate program as well as assisting in training of new members of Client Specialist team. Obtained ACI Spot Dealing Trading Simulation certificate while earning Best Chief Dealer honor. Contributing member of Chart Champions group tasked with adding cross-asset expertise to chartists / technical analysts. Leveraged financial and sales management experience to join #1 rated Life Insurance Company. Successfully managed portfolio of personal retirement funds in excess of $1M for clients. Created and executed business plan revolving around company’s strengths and targeted markets facilitating generation of maximum leads with minimal investment. Marketed company via community and networking events, business-canvassing, walk-and-talks, elevator approaches, direct mail and an online presence to garner necessary name-flow to set and maintain 8-10 face-to-face appointments each week. Utilized fact-finding and educational approach while meeting with clients to achieve a high closing ratio, customer satisfaction, consistent referrals and maximum commissions. Used technology to provide outstanding, comprehensive presentations to clients joining integrated and comprehensive solutions for insurance and financial needs. Attained Executive Council status in first 9 months at company. Achieved both Career Life Success Award and Career Life Producer Award. Qualified as 1of only 200 Life Insurance Case Rate Leaders in entire company Q410. 2-Time Winner of Hudson Valley General Office Rookie of the Month Award (December 2010 and January 2011). 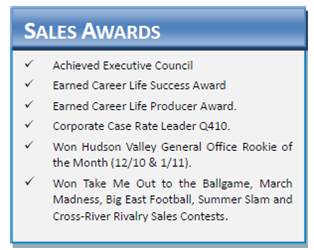 Winner of Take Me Out to the Ballgame, March Madness, Big East Football, Summer Slam and Cross-River Rivalry Sales Contests. Obtained Life & Health Insurance License in NY, NJ, PA and RI. Obtained Series 6 & 63 Securities Licenses. Oversaw enterprise that consisted of 50 employees including 20 inside and outside sales representatives spread over 3 locations with a multi-million dollar annual budget and gross average annual revenue of $2.62M. Devised and executed marketing strategies that aligned with revenue expansion goals. Established standards for sales processes and customer interaction/closing techniques. Identified and implemented process improvement and cost reduction measures to increase efficiency and improve bottom-line results. Managed relationships with lenders, title companies and appraisers, leveraging volume for superior pricing and turn-around time. Developed and taught sales, processing and compliance training programs. Held weekly status meetings with salespeople, telemarketers and processors, while administering payroll and benefits package. Helped design proprietary Web-based software to maintain full visibility into sales supply chain. Worked with bank executives on creation of new products and brought them to market minutes after release. 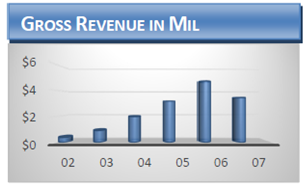 Grew revenue by 150% annually and generated $13.25M in gross sales (2004 to 2007). 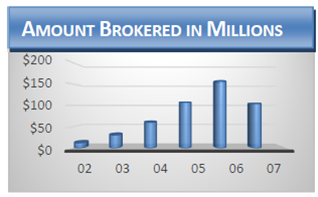 Arranged 1372 loans with 33 different lenders, brokerRed $426M in residential mortgage loans. Closed 82.7% of mortgage loans that entered sales pipeline. 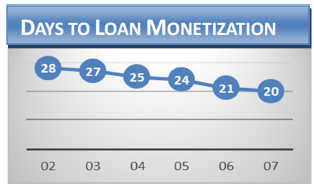 Reduced time of funding to 20 days from initial client meeting. Outsourced dispensing of 20,000 pieces of targeted and effective direct mail pieces each week to keep lead cost at 12%. Consistently top producing account for partner lenders’ most successful account executives, including several President's Club Members. Wrote and acted in 30-minute educational mortgage infomercial which aired on local television to raise company profile. Utilized screen advertising prior to movies to promote free weekly seminars to educate existing or potential homeowners. Passed all testing and completed all coursework satisfying requirements to be licensed / registered mortgage broker. Partnered with local home for physically and mentally challenged children, donating $50 per closing.